~~GuRu bHaI~~: Quest of Young India! Just now finished reading the recent novel by one of the renowned best selling authors Mr. CB! 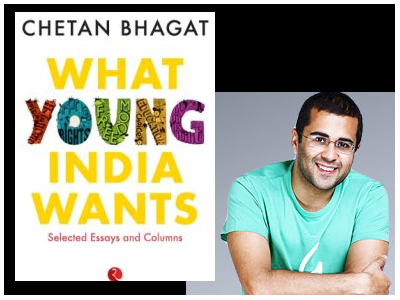 (Chetan Bhagat) Yep, the book was "What young India Wants?". From the prior list of books of this fictitious writer, we could anticipate tons of renditions from the title of the book he has tagged. "May be the Young India is quite interested in Gadgets, Cricket, Bollywood, Boozing, chaps or gorgeous ladies, Play station or stuffs like that! So, what we should do to incorporate deviation in the contemporary track of youth to make them productive!" This was my anticipation before flipping the first page. Usually, I never used to look at the back cover of CB's book where he used to depict the glimpse of the theme which would dilute my interest in reading further. But, my forethought was completely wrong which I have realized while flipping the first few pages itself. Introspectively, he has attached a letter prior beginning the novel by describing his life story via various impediments from the sediments of our country so as to justify himself for penning this book. From his intense promotional letter, I got to know that this novel would completely disappoint those CB freaks who would anticipate fictions in it. But still, I flipped with the hope that it would be informative throughout. And, yes, it was! More than expected! CB has intricately discussed about three major criteria of the country namely, Our Society, Politics and the Youth of today. His perspectives might not be wholly agreed by everyone including me but the propensity towards all the issues he has depicted was intense and resourceful. He has portrayed many hindrances in our society from all the roots of our tradition to the ongoing issues and their severe resultants in the offing. Also, he has depicted about the political disorders of the country and predicted their effects in deteriorating our national growth in all means. To fix all those vivid issues, India has the greatest potential being young. Yep, the median age of Indian population is 25 and almost 70% of the population is below 35 years of age. CB says, that we need to make use of this phase of generation change to find the solutions for all the social and political paralyses. We should inculcate the youth crowd starting from the re-framing of entire education system in the country which is sick for the past few decades. Reservation system should be precisely defined which has been functioning in the senseless scope all these years. He has also suggested his own ideas to solve certain sensible national issues like FDI, Kashmir dispute etc., which seem quite efficient enough to implement. In a broader view, he wants India which is statistically young to kindle a revolution in the country to burn out all the existing and imminent perturbations to grow at a faster pace in the global stage. Though his objectives of the book are quintessential for the current national scenario, his narration seems to be quite vague and he partially lacks the motivating energy to the readers. But still, it is worth of reading and would has possibilities to wake up the young crowd since most of his readers are youths. Final fictional story was quite impressive enough to fortify his perspectives and suggestions to the countrymen. Way to go CB! Please pen your fictions with motives and messages inscribed in your imminent write ups. It would really matter a lot to your young fan crowd. According to me, "Change is something which would never happen in India" is a kind of long standing superstitious thought which could be eliminated from the minds of whammy people of the country by a social cause called "Revolution". Hence, this book is indeed the best counsel for the quest of Young India. It would at least make the sluggish youths to think for a while amid their tons of useless commitments. Hoping for the revolution soon in our motherland which is what the young India really wants!